The Arab Struggle Movement for the Liberation of Ahwaz organized a mass demonstration entitled “we never forget our Ahwazi oppressed people” in front of the embassy of the Iranian occupying regime in the Danish capital on Saturday 10/01/2015. The demonstration was held to denounce the policies of occupation of Iran and its ongoing crimes against the Arab people of Ahwaz. 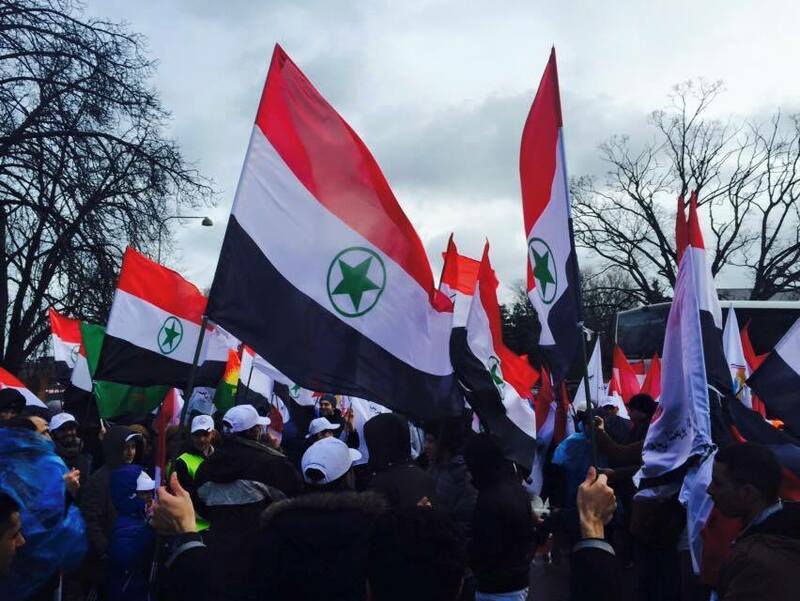 The Ahwazi demonstrators carried their protest through the streets of Copenhagen, chanting anti-regime slogans as they headed toward their final destination, which was a rally that gathered in front of the Iranian embassy. The Ahwazi crowds packed the streets outside the Iranian embassy in the largest anti-regime protest to date, shouting “Death to the Iranian occupation regime” as well as chanting slogans such as “Ahwaz will be freed, and Iranian occupiers will be out of it”. The protesters also carried Arabic and English signs reading “Stop the ethnic cleansing policies against the Ahwazi Arab people”, the world must condemn the land confiscation policies conducted in Ahwaz”. 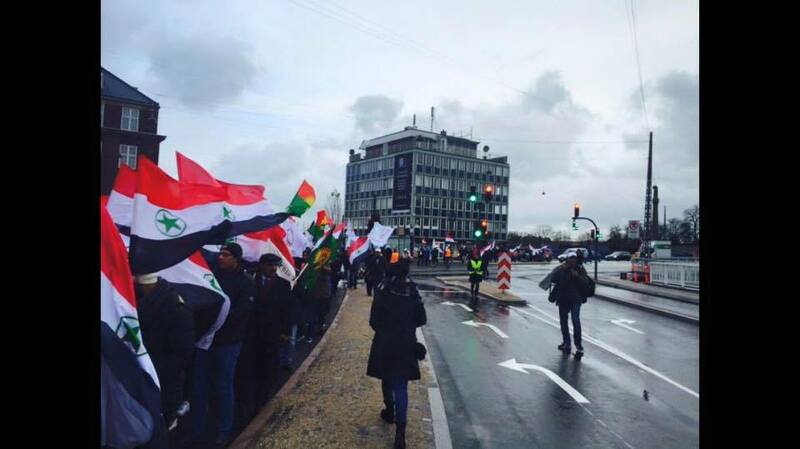 Many of the Ahwazi Arab protesters who participated in the massive rally came from various European countries. 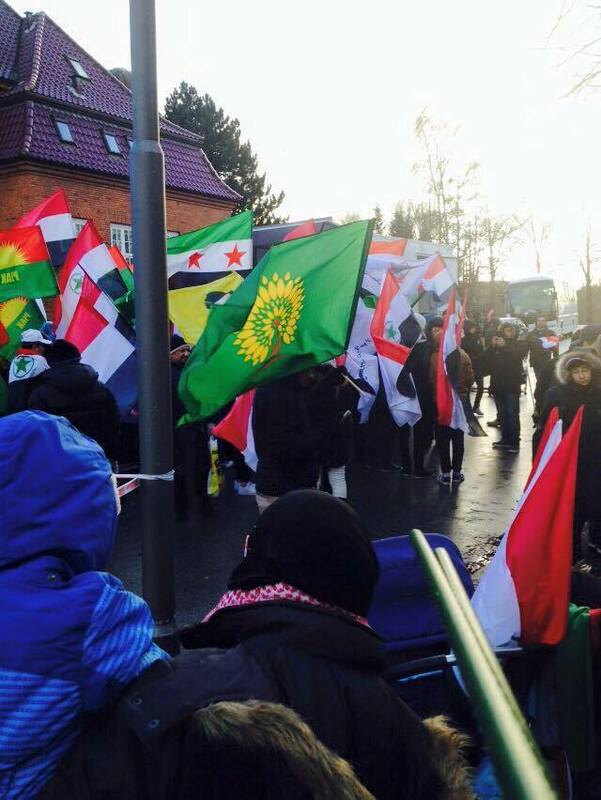 There was significant presence of the Arab community residing in Denmark who took part in the demonstration, showing their solidarity with the Ahwazi Arab people as well as a number of Arab brothers who are supporters of the cause of Ahwaz hailing from European and Arab countries were participants in the rally. The friends and comrades of the Kurdish, Baluch and Turkmen communities, whose people are under the enslavement and occupation of the Persian state made an unforgettable and effective participation in this demonstration, embodying the spirit of true friendship and collaboration and actual solidarity in the face of the most notorious occupation on earth. During the demonstration, Ahwazi participants raised the national flag of Ahwaz and carried posters of martyrs and prisoners and banners in Arabic and English condemning the policies of forced displacement and changing demographics which are being carried out by the sinister Persian occupiers. They strongly denounced and condemned the diverting the course of the Karoon River, where the occupying regime is pumping its water away from the Ahwazis and diverting it to central Persian regions. The organizers of the Arab Struggle Movement for the Liberation of Ahwaz who had called for this demonstration, stated during the Press Conference that despite grave human rights violations perpetrated against Ahwazi people, the plight of this occupied nation remains invisible to the world at large. Therefore, the ultimate aim of the demonstration is to bring it to the attention of the public and to demand that the international organizations place further pressure on the Iranian regime to stop the ethnic cleansing practices, the executions and arbitrary arrests of the Ahwazi Arab people, the detainees being mainly political and human rights activists. They asserted in recent years that around 35 Ahwazi Arab political prisoners have been executed but these atrocious and senseless crimes have elicited very little reaction from the international community. For years, Iran has been cracking down on the Ahwazi Arab people by mass arrests, torture and intimidation as well as carrying out the execution of innocent Ahwazi civilians. The wealth and natural resources, especially natural gas and oil, of Ahwazi lands are being extracted without discernible economic benefit for the Ahwazi Arab people. This racial oppression has led the Ahwazi people to be one of the most destitute and marginalized people in Middle East, with a very high incarceration and execution rate. The disfranchisement and ethnic discrimination policies of the Persian state have crippled the majority of the Ahwazi Arab population, as there is an estimated 80 percent of Ahwazi households living below the poverty line, while they are living on the ocean of oil and gas and mineral resources that are being exploited by the Persian occupation state since 1925 and still ongoing. The censorship of the press and media has been a serious obstacle for Ahwazi activists to voice out the non-stop abuses committed against the Ahwazi people. This serious obstacle has allowed the regime to discriminate strongly and consistently against the Ahwazi Arab people. The ethnic oppression includes the prohibition of Arabic, leading to the inability of Ahwazi people to study in their native language, the denial of job opportunities, the confiscation of lands and building Persian settlements for Persian settlers. At the end of the Press Conference, the organizers of the demonstration appealed to human rights organizations and the Arabic and Western media to speak out against the despicable crimes of the Iranian regime in Al-Ahwaz. And finally, to recognize Ahwaz as an occupied Arabic country.